Urban Composting – What Like it's Hard? New York City is world famous. Almost anywhere one travels on this planet, everyone there will know of New York. It is modern, fast, furious, and constantly changing. As we plow ahead into the future we mustn’t forget New York’s fabled past. Seeing these soaring boxes of metal and concrete, it is easy to forget (or maybe you never knew) that the island of Manhattan used to rival Yellowstone National Park with the amount of different ecosystems that sat on its shores. What had to happen in order to put up all of these massive buildings? After Native Americans were tricked into selling the land (when they didn’t even believe in land ownership,) trees were knocked down. Natural habitats were destroyed, and many native species were lost. Soil was razed. The soil in New York City was literally destroyed in order to make way for these massive feats of human ingenuity. That destruction of the soil has happened across the country, as scientists, farmers, and others have modified crops to perform better. Crops that grow faster, and can withstand certain types of pesticides, even generating the pesticides from within, and that must be replanted each year have become the standard in the United States. This constant agitation depletes many, if not all of the naturally occurring nutrients of the soil. We can’t, at this point, just break down all the buildings here in New York in order to rebuild the natural landscape. We can however, create rich, fertile soil for use in public parks, and community gardens, all the while keeping greenhouse gas causing waste out of landfills. How? Composting! What the heck is composting to begin with? Just as New York’s skyline is constantly changing, all life is doing the same. The natural rhythms of the planet dictate that what is living will die and become something else. That is what composting is. It breathes and breeds new life. 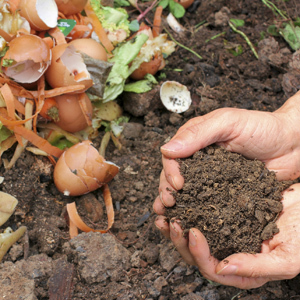 Composting uses organic matter, such as banana peels or coffee grounds, to create fertile soil. It is life giving. Or shall we say, life recycling. There are many different ways to compost, but for city dwellers, it’s been made super easy. New York City’s Department of Sanitation does it for us! All you need to do is save any “food” that you would otherwise throw out, and drop it off at one of NYC’s many green markets. Just shaved some carrots? SAVE YOUR SHAVINGS! Wait! Don’t toss out that tea bag! Not going to reheat that rice from two nights ago? Don’t throw it out. As long as there’s no mold or rotten bits you can save it for composting! You might as well start now! In the next coming years it will become the law in NYC, and the department of sanitation has begun a roll out program for curbside collection. Check if your hood is eligible, and you can request for your landlord to participate! http://www1.nyc.gov/site/dsny/recycling-and-garbage/residents/organics-collection-and-drop-off-for-residents.page. Since I began saving my food waste for composting, all I have left is recycling! Trash is nonexistent in my apartment! I’d love to keep the conversation rolling about composting, and other sustainability related issues, and keep this as an ongoing series. If you have ideas, questions, or comments, or begin composting share here, or on Instagram with @100thseed or @envirospence.